It’s official. Brian Elliott is taking over the net for the St. Louis Blues. On May 19 Elliott signed a three-year extension with the Blues. Ryan Miller, the previous No. 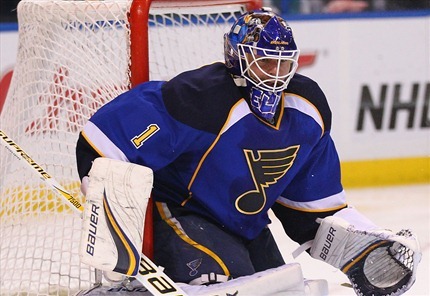 1 goaltender for the Blues was let go after a high stakes trade and a less than expected short season in St. Louis. Elliott went 18-6-4 with a 1.96 goals-against average and a .922 save percentage last season, playing just six games after Miller had arrived in St. Louis. The twenty-nine year old Ontario native is 55-24-7 in three seasons with the Blues; splitting time with previous Blue Note goalie, Jaroslav Halak. In the 2011-2012 season Brian Elliott and Jaroslav Halak set a franchise record for most combined shutouts (15). They became the first tandem in NHL history to record at least 6 shutouts each. Elliott also stated that he was happy to have Allen as the other Blues goaltender. He said Allen has “the most similar types of personalities of anyone that I’ve played with. “He went on to say he enjoys most others he has played with, but their similar personality types would benefit them both when it game to goaltending strategies. Blues fans already stand behind Elliott, and Allen for that matter, so it will be interesting to see how the two men handle the upcoming season.